On our last two visits to New York City, Tawn and I have fallen in love with a small panini shop and wine bar in Greenwich Village called ‘ino. The ambience is fantastic, the service is friendly, and most importantly the food is good. After buying their cookbook on my last visit, I’ve eagerly awaited the opportunity to try and recreate their most perfect menu item: the truffled egg toast. 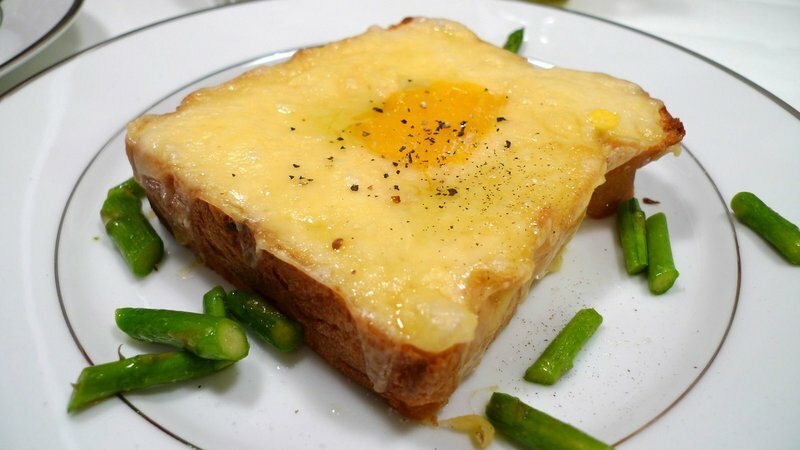 Perfect for breakfast, perfect for lunch, perfect for dinner, the truffled egg toast (original pictured above) is a thick slick of white bread, lightly toasted, with a pair of egg yolks gently baked in a well in the center of the toast while Fontina cheese melts along the edges. Afterwards, it is drizzled with truffle oil and generously salted and peppered. Lightly grilled asparagus provide the perfect condiment. 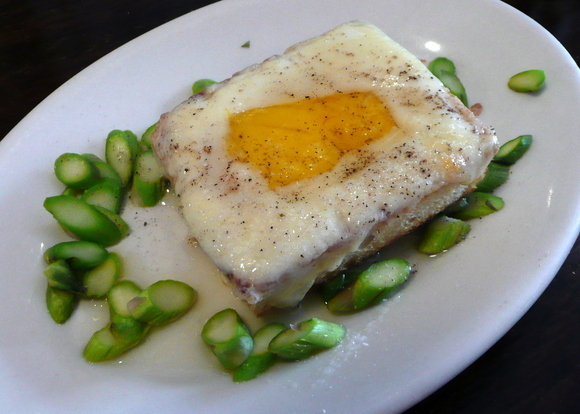 It is hard for me to convey in words just how wonderful the combination of flavors is: Truffle, egg, cheese, and asparagus just go together really well. The big problem I faced here in Thailand was finding a loaf of bread that isn’t sliced. I could bake it myself, but the ideal bread for this is a white sandwich bread, not something rustic like my homemade bread turns out. Finally, Tawn spoke with a manager of a bakery and they said we could order unsliced loaves a day in advance. 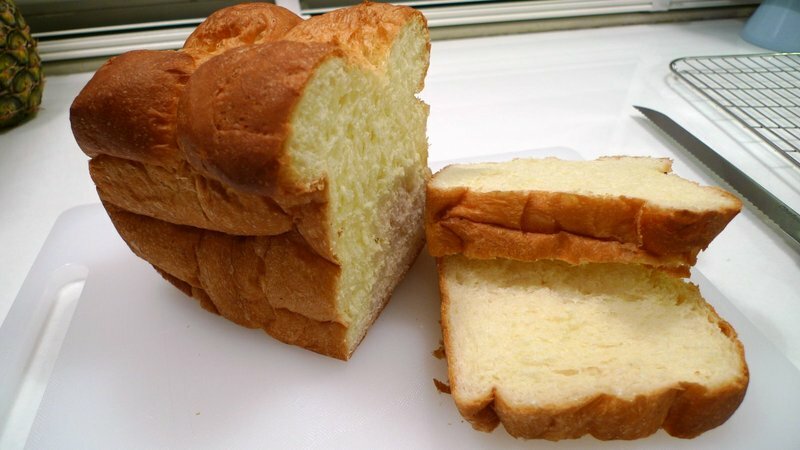 Once we got the bread home, I realized it was a little too airy, sweet, and eggy – kind of like Portuguese sweet bread – to be ideal. But I decided to press ahead with the experiment. After toasting the bread lightly in the oven, I used a serrated knife to cut a 2-inch square in the middle of each slice, cutting about halfway into the 1-inch thick bread. Then, using the handle of the knife, I tamped the bread down, forming a well. The next step was to line the edges of the toast with Fontina cheese. Except, in cheese-unfriendly Thailand, I couldn’t find Fontina so substituted Gouda. Cheese is very expensive here and the types you find are very inconsistent. A few months ago, I saw Fontina. But when I went to the store this time, there was none. Not following directions, I broiled the toast rather than baking it, so the egg set a little firmer than was ideal. That said, upon pulling the toast out of the oven, I stirred the egg with the tip of my knife and it turned out to be plenty runny. The biggest problem was my truffle oil. This oil has a limited shelf life and the oil we have is over a year old. The strength of the truffle aroma is nearly gone, so we weren’t getting a healthy dose of that heady earthiness that makes truffles so wonderful. Thankfully, we had a jar of black truffle salt on hand, so I liberally sprinkled that on top of the toast. The conclusion? Well, I don’t think I’m going to put ‘ino to shame anytime soon. 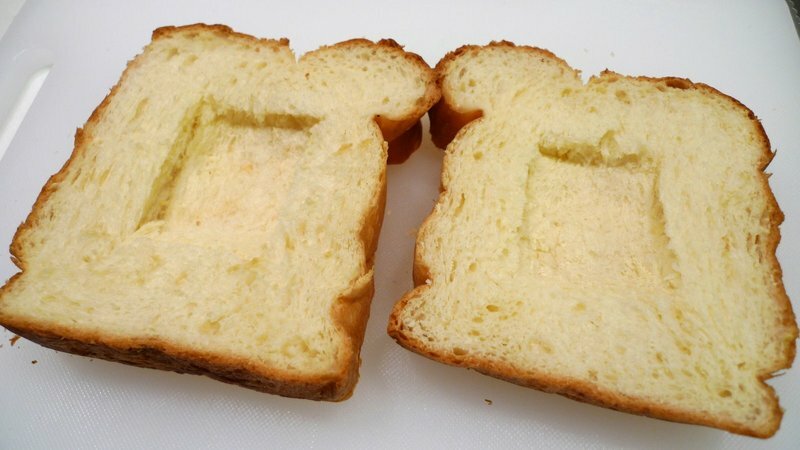 But with a little practice, a better choice of bread, cheese, and oil, and more attention to the directions, I think I’ll have a truffle toast worth serving to guests. And considering that the real deal is 9,000 miles away, I think Tawn and I will be able to live with second-best until our next visit to New York! This entry was posted in Uncategorized and tagged Asparagus, cooking, Egg, food, ino, Toast, Truffle by christao408. Bookmark the permalink. That looks pretty delicious. And I hate eggs. It looks fantastic. Made my mouth water. Yum. Omg! That looks to die for! I’ll have to check out the restaurant the next time I’m in NYC! Mind sharing the recipe with me? Looks good, and a lot of cheese! I love egg and cheese combination! hmmm…interesting. i’ll have to look up the place next time i go into the city. funny thats the thing theyre known for and ive actually never tried it. next time i go i will order it 😀 and btw.. urs looks identical.. heheheyou should make ur own bread next time!! It looks and sounds wonderful! I’ve never heard of this, so thanks for introducing this to me! I would try anything with eggs at least once. I guess it’s because I’ve never even left the US in my life (save Canada) but it is sometimes surprising to me when I read your posts, how there is a limited availability of certain foods (i.e. certain breads or cheese, as you mentioned.) I don’t really “get” that … must be my American mentality, to sit back and scratch my head, thinking, “What? You DON’T have a ton of different types of breads and cheeses?” I must be just another spoiled American. I admit … I’m not a fan of eggs so your pics didn’t draw me in as they normally do – but I love how you chronicled each step. That part, is always so cool in your posts. Hrm, I think that recipe certainly deserves another shot. It looks delicious! I think I might have to give this a try. Looks so yummy. yum, looks delicious! i’m going to tryout a new recipe myself this weekend… if it goes well i’ll try to post some pictures. Keep on trying!Don’t you wish you were in Wisconsin right about now? Fresh ingredients are always key. Still looks pretty good though. Mmmm, cheese….. I think I will try this on Saadia. 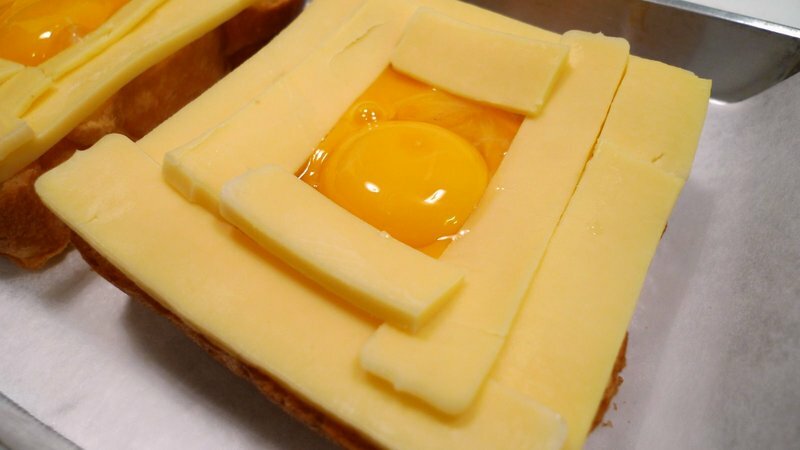 She loves eggs like that, and with cheese around them,…. yes she will like it. I know I love it already. Thanks for sharing, Chris. @Passionflwr86 – It would be an interesting post to talk about what my supermarket (or regular Thai markets) are like, except I don’t think the supermarkets would let me take pictures inside! They are smaller than most markets in the US by a considerable amount but still carry a wider variety of foods. In fact, probably more diverse (in range) than in the US because they are catering to expats from many different countries. Unfortunately, what they have in breadth they lack in depth. @Roadlesstaken – Try it! Well, seems like you have almost made an exact duplicate. Just need to give it a couple more tries! Chris, there are so many delicious dishes you have prepared so far, it will be a tough decision on which one to order from your kitchen when we visit you guys! @christao408 – Haha~no excuse at all! We are planning sometime around August or September, depending on W’s Med. Board exam results. So, I’m checking flight schedules and costs in the coming months. @christao408 – LOL It’s on your conscience then if I am covered in bruises. @twentyse7enn – Ha ha ha! XD@yang1815 – Zero C or Zero F? @CurryPuffy – Oh, good! And we’ll probably be in LA in July or possibly late June. @christao408 – Great weather in L.A. by then! Hope to see you guys! I’ve never tried truffles before. I remember you writing about this egg dish in your NYC entries. I have a funny feeling you’ll get this dish down pat in no time. @ElusiveWords – Yeah, this one isn’t a technique problem. It is an ingredient problem. If I locate the right quality bread, the correct cheese, and a new bottle of oil we’ll be set.